We upload and promote your deal to thousands of people using social media channels… leave the details to us! If they like your deal they buy it! If they really like your deal, they will tell their friends to buy. Some will be after a bargain, but if you make their experience worthwhile then you got yourself a loyal client! Every day we find great products/activities/services available in Doha. We market an offer in a way that is seriously cool to our members and visitors and post the deal on our website. We email members and inform our followers with the deal and businesses generate hundreds of new customers. We have a high degree of in-house expertise to not only advise on a deal that members will adore, but to also create the promotional tone and the images that best sell it. Once produced; your brand, your company, your deal goes viral to thousands of members through our social media networks. Qgrabs is a new way to welcome thousands of new customers. Traditional advertising campaigns consist of you shelling out thousands of riyals to get creative material produced and thousands more on media charges. You risk spending lots of riyals with no Guarantee of new business. We make our money by taking commission on sales we generate for you (You win, we win!). It’s accountable, cost-effective and generates hundreds of customers quickly, efficiently and in a way that WOW’s the crowd! Our members are sophisticated urbanites who are traditionally hard to reach but who use their social networks to talk about products and services they love. Let your business be the talk of town! For more info, please contact us and we will be more than happy to sit with you and go over the details. Get in touch If you have a great deal and looking to generate new business and expand your customer reach in an awesome way, then we definitely want to hear from you. 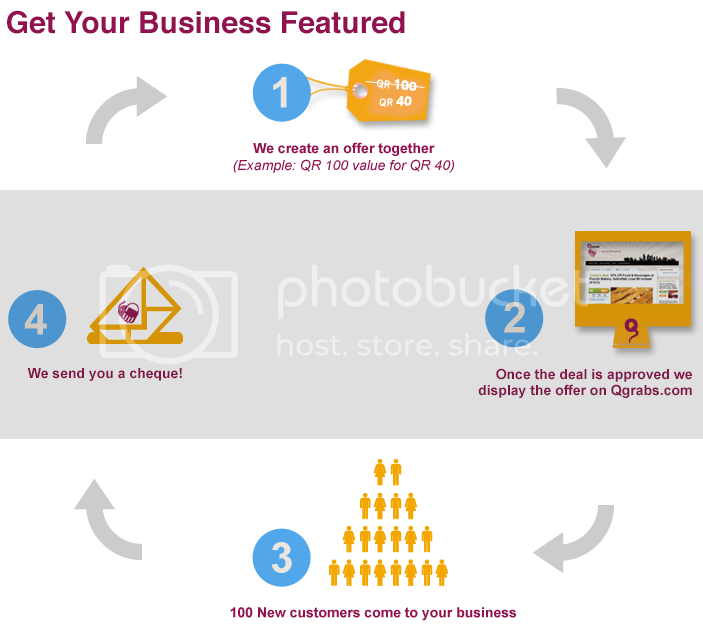 If you are interested in posting a deal on Qgrabs tell us a little more about you and your business. Get in touch by sending us an email and we’ll get back to you shortly.